The recent week has seen crude oil soar through $140 onwards and upwards to a new record high of $146. Much of this gain has been attributed to the growing tension in the middle east with regards a possible Israeli strike on Iranian nuclear infrastructure and the drop in US oil stockpiles.The rise has been accompanied by investors dumping stocks as highly inflationary oil prices continue to contribute towards the destruction of economic activity that pushed the major US indices into technical bear markets (20% down from Oct 07 highs)..
My original target for crude oil for 2008 is $150. The rally to date has been far stronger than expected and on face value is signaling much higher prices. Despite crude oil having reached an overbought state since late May, oil prices have stubbornly refused to embark on a significant correction. On a short-term basis, crude oil is moving in an up channel with an current upper boundary at $147, the temptation exists for crude oil to clearly to continue snaking along the upper channel line in a very dangerously overbought state until oil prices hit $150. This is thus suggesting a continuing trend higher despite the overbought state for another $3 to $4 to try and hit the psychological $150 level. Following which the short-term chart is targeting a swift downtrend towards the support channel at $135 to unwind the short-term overbought state. On the longer term weekly chart crude oil is critically overbought, the chart implies on a technical basis that a correction is imminent and again confirms a target of $135, which if breached would target a similarly swift move towards $110. However the technical's are at the mercy of BLACK SWAN events, primarily an attack on Iran which WOULD result in a SPIKE higher, how high ? That's something outside of technical analysis. Another factor that could result in a crude oil spike higher against the bearish technical picture would be if the US Dollar PLUNGED to new lows. The US intelligence agencies concluded in December 07 that Iran was many years away from building nuclear weapons, possibly by 2015 at the earliest. However the problem here is the lack of confidence in the accuracy of US intelligence given a string of huge intelligence failures. A strike against Iran would not require extensive military hardware, and given the eagerness of Israel, may not involve US air forces at all. 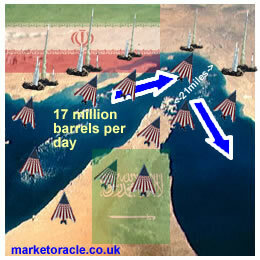 However an attack against Iran would result in retaliation that would spike crude oil much higher. The obvious immediate target for Iranian retaliation would be to try and stop oil shipments through the gulf of hormuz through which 17 million barrels per day flow or about 19% of the worlds supply. This would result in a prolonged campaign and not something that would go away in a few weeks, therefore the risk is for crude oil not only spiking higher but remaining at elevated levels for the duration of the crisis, even in the face of economic contraction in the US and elsewhere, this would be disastrous for the distressed financial system and global economies, even the emerging powerhouses would feel the impact that would nudge up already excessive inflation rates of 10%+ many notches higher. Even if the Iranians failed to stop most of the oil flowing through the gulf straits, a shortfall of even 2 or 3 million barrels per day would be enough to tip the precariously balanced world supply / demand into oil shortages, which would result in panic buying and hoarding thus exacerbating the situation. Therefore this suggests an attack against Iran has to be a low probability of less than 20%, that is unless the Whitehouse is gripped by madness in its final days, hell bent on delivering a scorched earth economy to the Democrats in Novembers election. In Summary - The technical picture is bearish suggesting an imminent significant correction, but black swan events such as a strike on Iran or a US Dollar collapse would lead to a spike much higher with dire economic consequences.